We live in Ireland and given the Irish connection to Dracula, we couldn't visit Romania and not go to Transylvania. Irishman Bram Stoker took the inspiration for his classic horror novel from the legend of Vlad the Impaler, a Transylvania-based ruler with a thirst for blood and an imaginative approach to war. A four day weekend centered on Bucharest leaves just enough time for a jam-packed day trip to Transylvania. 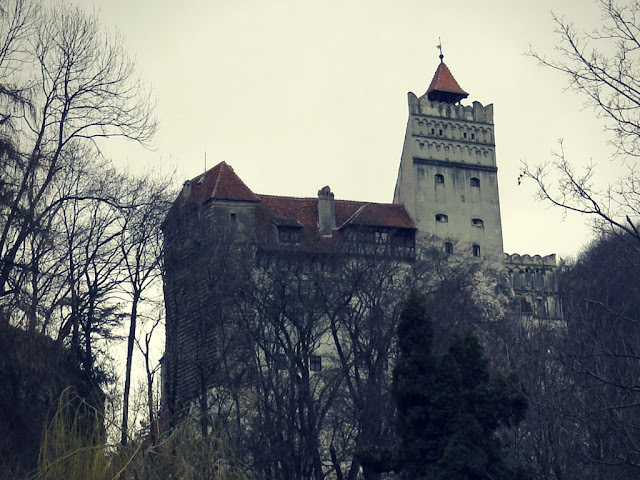 We joined the TripMaker Day Tour to Transylvania which took us into the heart of Dracula's lair. 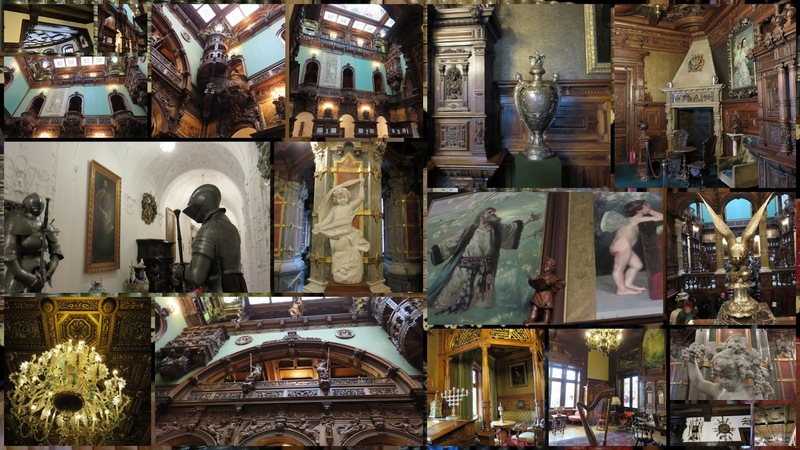 Peleș Castle is about a two hour drive from Bucharest. 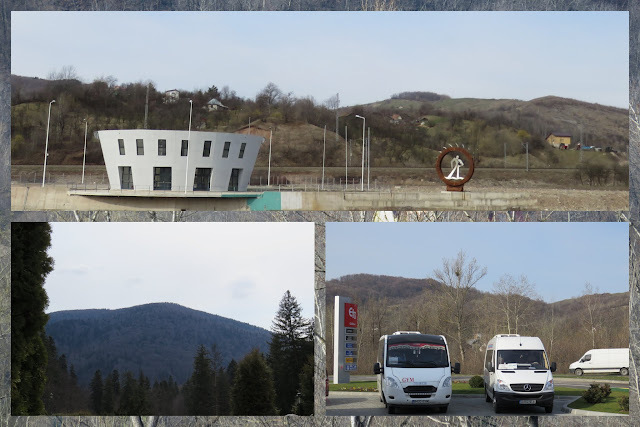 The energy and fading architectural grandeur of Bucharest soon gave way to a countryside dotted with whimsical art and then the rolling green of the Carpathian mountains. 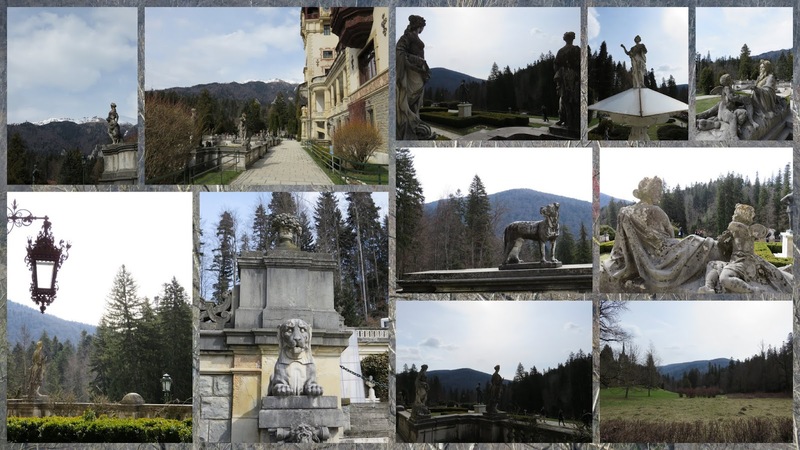 We soon arrived at Peleș Castle and took time to explore the grounds before our tour in the bracing mountain air. A sculpture garden added great atmosphere to the sweeping views before us. 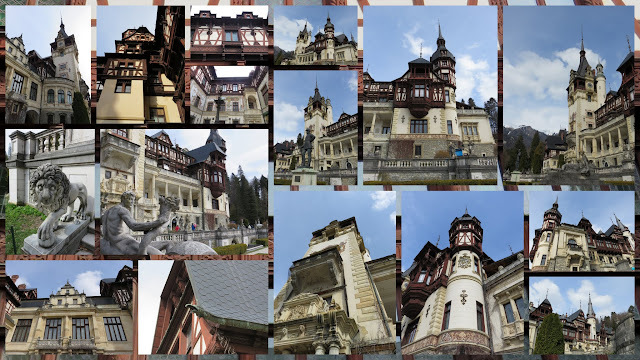 Peleș is a neo-renaissance design built between 1873 and 1914. A half-timbred facade and whimsical towers greeted us on arrival. The palace is truly stunning. The interior of the castle was sumptuously decorated. We had limited time to explore, however. The castle seemed to be bursting at the seams and our 45 minute tour turned into a 20 minute whirlwind as we were herded through. At one point we nearly lost our tour guide amid the crowds. It was difficult to hear and see as our tour guide was forced to take even more people around the interior with him (beyond just the group from our small bus). On to lunch! 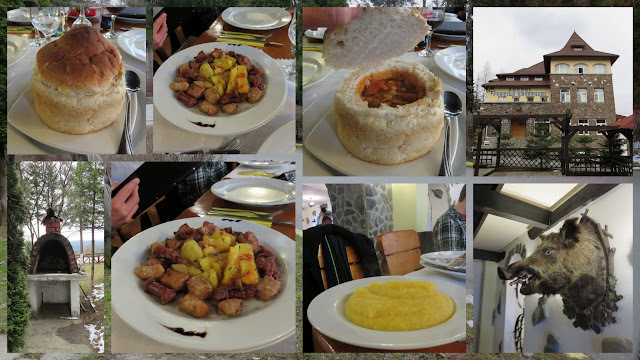 We stopped at a restaurant and inn in the Transylvania countryside for lunch. Soup in a breadbowl, a pork plate, and papanași filled us up for the journey ahead to Bran. We arrived in Bran on an overcast and chilly afternoon setting the mood perfectly for our visit to the town that inspired Bram Stoker's Dracula. 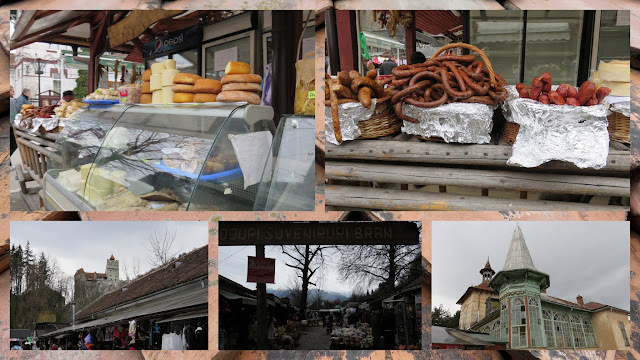 A touristy market sat at the base of the hill under the shadow of Bran Castle and featured some yummy Romanian treats to eat. 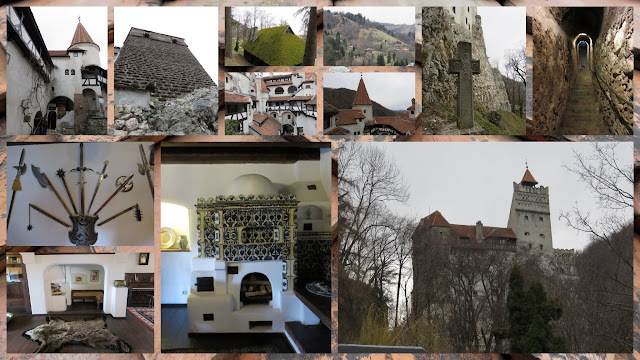 People often say that visiting Bran Castle is anticlimactic given what they imagine after reading Dracula. The site of Bran Castle and its original occupant Vlad the Impaler inspired Dracula but the description of the castle itself is fictitious. We enjoyed our visit, huffing and puffing up the hill just as Jonathan Harker did at the beginning of the book. We passed a macabre cross on the way up. A selection of weaponry hung on the wall and we were able to explore dark stone passages again much like Harker did as he tried to escape from this place. Spooky! I definitely recommend reading Dracula if you haven't already. You can buy Dracula on Amazon or get it free on Kindle. The book is 100 years old but a complete page turner! We finished our whirlwind day tour in Brasov, a lovely pastel colored Transylvanian town. 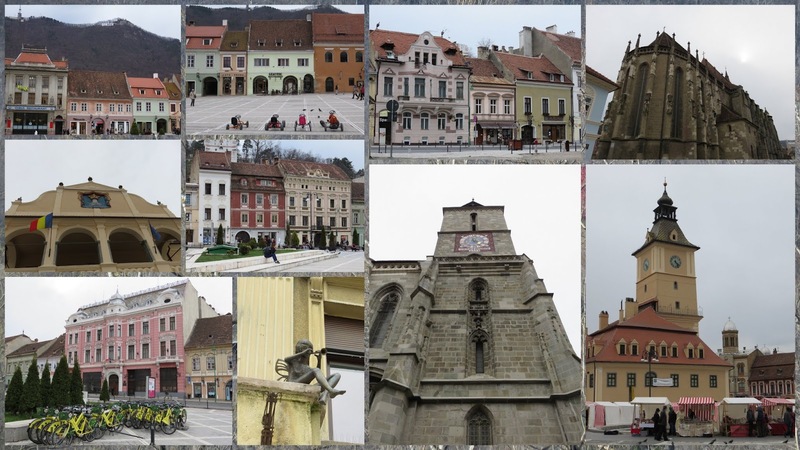 We had about 30 minutes to explore and only after we reminded our tour guide that we were promised a walking tour of Brasov and not just a drive by in the bus... We got our walk in the end and spun around the main square looking up the Hollywood-esque style sign declaring 'BRASOV' on the hill above. It was a long and tiring day trip but totally worth it to see a bit of Romania beyond Bucharest and visit the places that inspired an entire genre of horror literature and film. Review of a whirlwind Romanian day tour from Bucharest to Transylvania including Peleș Castle, Bran Castle, and Brasov.